The red squirrel has been a native of our land for several thousand years, whereas the first greys were brought here from North America in 1876. Over the years more were introduced, notably by the Duke of Bedford to the park at Woburn Abbey where they thrived. Undoubtedly, the grey squirrel has adapted well to our countryside and towns; some would say at the expense of the red squirrel, which is only partly true. Certainly direct conflict between the two species seems to be unheard of. It is not so much a case of the grey squirrel driving out the red, but more a case of being better equipped and more adaptable. A major factor is the ability to survive tough winters due to the fact that greys generally carry more body fat. Although the size difference between the two types of squirrel is not dramatic, a full-grown grey can weigh almost twice as much as a red. Grey squirrels are also more adventurous and happier foraging on the ground, whereas red squirrels spend most of their lives high up in conifer trees, and their diet is less varied, although both species are generally vegetarian. 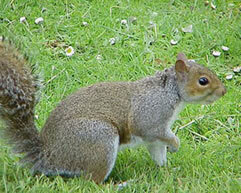 So why are grey squirrels still often regarded as vermin, compared to their popular cousins? In the 1920s and 1930s, grey squirrels were beginning to cause significant damage to commercial forestry; in particular to beech trees. A law was passed in 1938 banning further importation of these creatures, and in following years various methods were tried without success to control grey squirrels. Many people still call them ‘tree rats’, but they are here to stay and give much pleasure, especially in urban parks and gardens where they become quite bold. It should be mentioned that huge colonies of the red squirrel population were wiped out between 1900-1920 by the parapox virus, which is similar to myxomatosis in rabbits. Not only that, but red squirrels were hunted right up until 1927. In fact there was even a Highland Squirrel Club dedicated to this ‘sport’! Hunting, disease and changes in the management of forestry all contributed to the population being drastically reduced, from which it has never recovered. Man should accept the blame for his part in their demise. As many people will have observed, grey squirrels are playful, curious and agile animals, and living proof that man can’t always assert his will on nature with poison and guns. Farmers and foresters have learned to live with the grey squirrels and are beginning to manage forests to encourage red squirrels, particularly in the north-west of England. Still found throughout Ireland, Scotland and parts of Wales. Rare in the south of England, apart from Brownsea Island (near Poole) and the Isle of Wight. Projects are in place to encourage the population in parts of northern England. Found extensively throughout England and Wales, and in some parts of Ireland and Scotland. 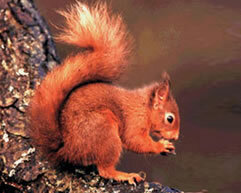 Known to co-exist with red squirrels in a few areas of the United Kingdom. Whilst there may be 1-6 young, the average is about 3. It stands to reason that most babies or youngsters are found in March/April and August/September. The youngster may have fallen from its nest, be caught by a cat, dog or other predator or simply may have strayed too far and lost their way home. If your cat brings one home, it may be wise to keep an eye on the cat to make sure it doesn’t immediately return to try to find more young squirrels. Squirrels don’t always nest in trees; sometimes preferring lofts, sheds or other buildings. Sometimes squirrel nests are brought to earth when trees are felled or lopped. Obviously great care should be taken not to disturb nests during the months shown above, especially in oak and other broadleaf trees. We were once presented with a complete nest found by a young lad on his paper round. The babies were only days old, no larger than a child’s finger. Completely blind and bald, they are known at this age as ‘pinkies’ and are extremely vulnerable.